With Contact Center increase your sales and customer satisfaction. The Contact Center is now a part of the portals provided by CRM-service Oy. It includes modern functionalities, real-time connection to CRM and reporting features. Like the CRM, the Contact Center is a fully cloud-based service. An agent can complete the contact’s information, which will then be updated in the CRM right after saving. It is possible to send the contacts email templates that are branded for the company. Therefore in example provide the potential customers with additional information. The managers can create survey templates, that are completed by the agent during the call. This way the information is always saved on the contact entity and it can be later accessed by others as well. The Follow up notes after the discussions are saved and shown automatically on the checklist of the agent. The portal provides the managers and the business management with a comprehensive reporting view of the campaigns. The whole contacting process happens on the contact’s page (in the Campaigns module, by selecting first the campaign and then the contact). The contact information as well as all the functions concerning the contact are accessed on the same page. After each call, the agent categorizes the result of the call (see the picture below). The call and the result are then saved in the communication history of the contact, which is shown on the contact’s page. 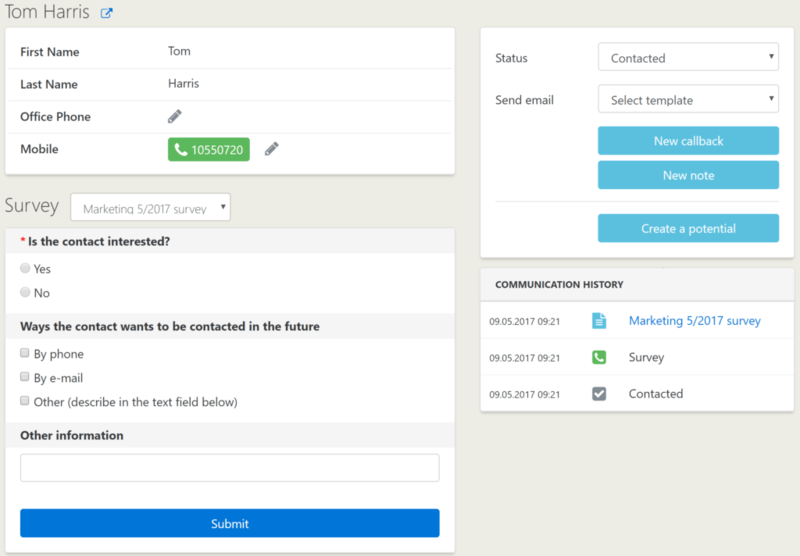 In addition to the calls, the communication history shows also the status changes of the contact, notes and callbacks created for the contact and the emails sent to the contact. An agent can easily access all of these functions in the block above the communication history (see the previous picture above). The callbacks assigned to the agent are also shown on the home page of the agent. On the Home page the agent can make a quick glance on their calls as well as the overall progress of different campaigns (see the picture below). In addition, there is a section where the agent see the callbacks assigned to them for the ongoing day. 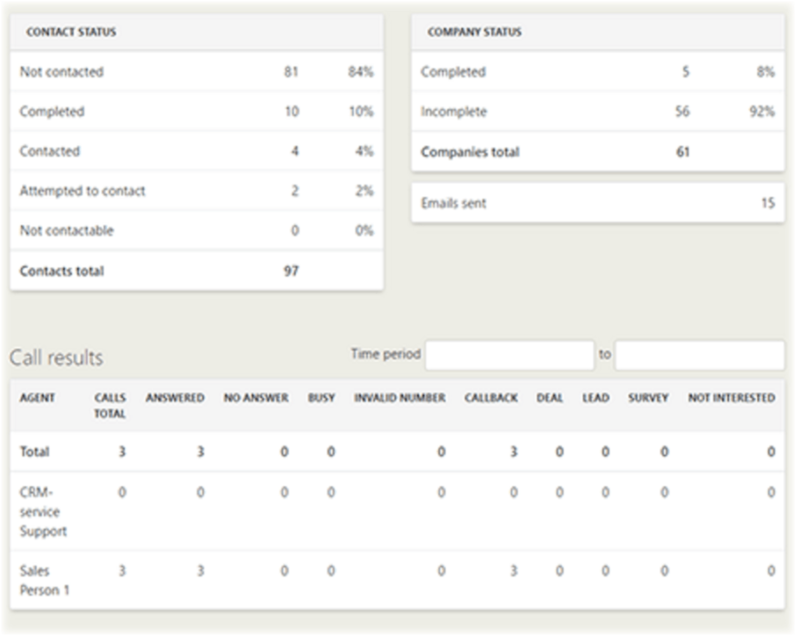 The management (admin users on the Contact Center) can follow the campaign statistics in the Admin module’s Reports tab. 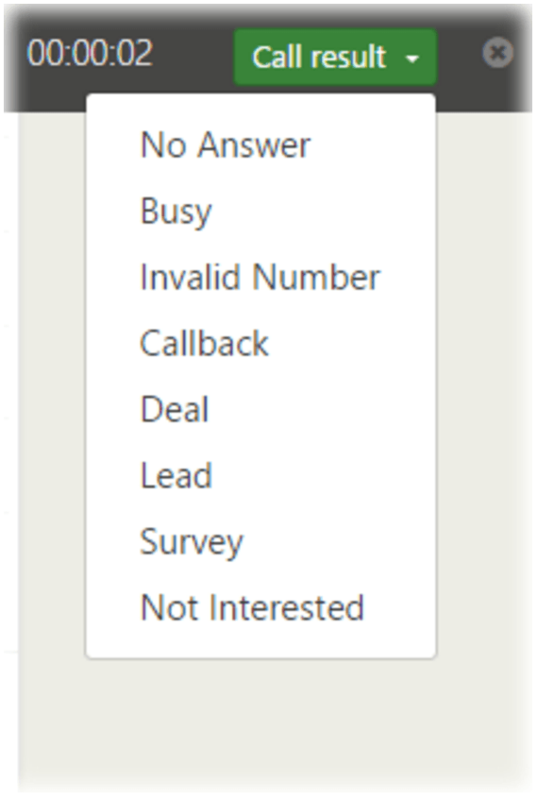 Here the admin can check the summary of the contact and company statuses of the campaigns and monitor the call results by each agent (see the picture below). The call results can also be filtered by a time period. 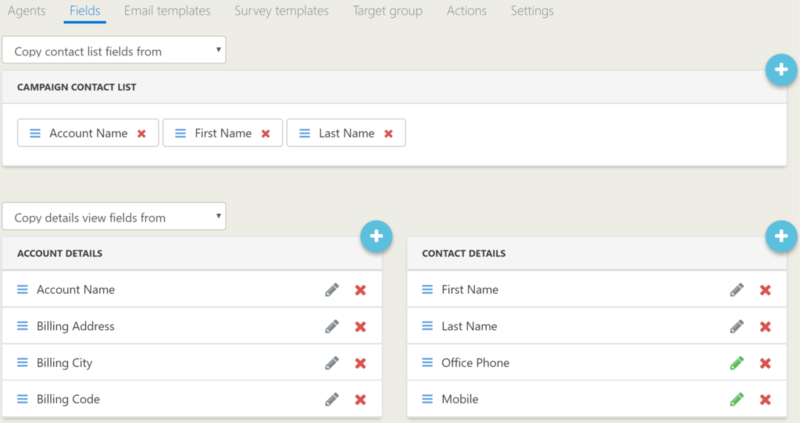 On the Campaigns tab of the Admin module, an admin can assign agents for campaigns, customize the list views and fields shown on the contact pages of the campaign (see the picture below) and activate email and survey templates or actions for potential creation for the campaign. On the Target Group view it is also possible to assign and reassign certain contacts to certain agents. All of these settings are done to each campaign separately, but the settings for one campaign can be copied from another. The changes made are saved automatically and will be applied immediately.